Look at our beautiful, re-designed ISAAC T-shirt! This is the shirt we’ll all be wearing for Listening on August 12 (Westnedge Hill) and August 13 (Milwood Neighborhood.) They’re good for every other day too! 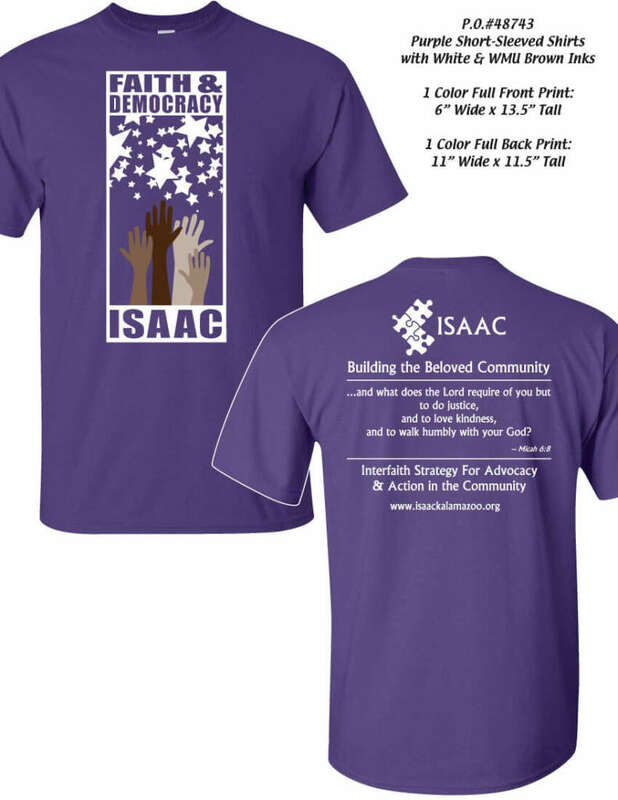 Ordering your T-shirt ($20) supports ISAAC financially, and spreads our message. Is $20 unaffordable for you? You can borrow a T-shirt for Listening on Aug. 12/13. Or we’ll reduce the price for you, with the help of others who can chip in extra. (Sorry, but we can’t afford to give the new shirts away!) Either way, please let the office know what size you need and what you can pay. Or you can even wear a different dark purple shirt for Listening. Can you chip in $10 extra to help someone else afford a T-shirt? THANK YOU! Do you already have an ISAAC T-shirt just like this but with red letteringon the front? Then, yes, you can wear that one on Aug 12/13. Or can you bring it for someone else to borrow?